The proportions looks bang in range of i20. First with Ciaz and now YRA, Suzuki is upping the ante. Super pricing by KTM ! RC390 for 2.05 L and RC200 for 1.6 L. It looks like the RC twins will get a strong start similar to Duke twins. Suzuki showcased Swift DJE at the Tokyo motor show. DJE comprise of regenerative braking and start - stop technology, which results in 1.2 litre petrol delivering 26.4 kmpl. Also there is color changing speedometer which changes color depending on the throttle response. 5 years, and it just feels yesterday! When R 15 and Fz were showcased at the 2008 Auto show, all the attention was towards the track focused R 15! I must admit, it was R 15 which garnered my attention. Although Fz was showcased, it played more of a side hero role. Immediately followed the spy pics. But it was then, when I saw it in person, it looked a bit small, and realized, riding 30 kms+ a day would be a task. By the time R 15 was launched, spy pics of Fz started rolling, and the first pic that I saw, was that of rear three quarters! Boy, the massive rear tyre, my eyes popped out. It looked like a bike of quarter litre (and above) category. Those beefy looks were just mesmerizing. I just kept tracking all the development. And then came the launch day. I usually research a lot, the same I did while buying the bike, but it was simply heart over head this time. I was truly smitten by its persona! For me it was a perfect bike, healthy spec sheet, superb quality, and the icing on the cake was the pricing. 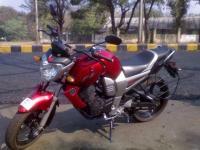 My bike was amongst first few in the city, I enjoyed every bit of attention, and till this day it has the same charm. The quality of bike is top notch, the parts have aged well. It's commendable that the bike has held its own in these 5 years. There is simply no competition, Honda has tried twice, but didn't succeed. For quite a some time it was the bread winner for Yamaha, and still moves decent numbers. It had its little niggles over the period of time, but once you are smitten, you just let it pass. I won't mind Yamaha continue with this timeless design for 5 more years, all I wish was a little more power! This may be refreshed Rodeo! We can't rule out a new product name. The headlamp looks awfully oversized! Mahindra isn't paying as much attention to the 2 wheeler unit. Since the length of engine bay looks similar to regular Wagon R, diesel is out of question. Look closely at the third row, there is no boot space! So its difficult to say whom MSIL will target if they decide to bring it here ( which looks quite improbable to me right now) . Intracity cab, I guess ! The dual clutch gearbox will ensure high sticker price. Manual gearbox will be saner option. Anyways there are very few takers for the petrol variant, it won't matter much. In the form of Grand, Hyundai has given Swift a real competitor. Altough Swift is a drivers car and has better engines, Grand scores up in the form better interiors and space. In city, performance hardly matters, but comfort does. I expected the Grand vs. Beat debate coming up. But I think Hyundai is squarely aiming at Swift as i20 is priced on the higher side. Beat is no competition, monthly sales clearly depict it. Also Grand is more spacious, powerful and better equipped. And yes, one important point I forgot to mention: Sound insulation. This car has supreme sound insulation, best in class. The only deterrent was tyre noise. The doors are not heavy, they have the typical Japanese / Korean feel. Very good NVH levels. I expect the 0-100 dash in about 15 seconds , with better 20-60 numbers compared to competition. @VR.46 Ride was pretty sorted out. Neither mushy nor overtly stiff. Pretty much balanced, with some softer edge. @AMG1 Sorry no pics. due to time constraint and thank you for adding some in the post. @PrancingHorse Thank you. Secondly, I'm with their strategy, it gives them larger audience considering the large price bracket i10 & grand will cater. I was waiting to get my hands on the newly launched Grand i10 ! Finally got a chance yesterday. To start with, I really liked the stance, the presence of car. All modern Hyundai are smart, this looks the most matured. The headlamps are contemporary, the grill is the focal point, the face looks similar to Eon, but without the quirkiness. Move to the side and here you will notice, that the Grand has grown bigger compared to i10. The shoulder line looks smart, there is no unnecessary fussiness. Move to the back, this is best designed part, it looks so fresh ! All these years, right from the first gen santro (barring Xing) it felt like the designer forgot to design the rear, but this time the slab like rear is gone. Move inside and you will be greeted with smart airy cabin. The use of colors is good, and as always, the quality of materials is A grade for its class. Front seats are fairly comfortable and adequate in size. They are certainly not sofa-like as in Swift, but still adequate in terms of bolstering. Move to the rear bench and you are greeted with plenty of legroom. As in every Hyundai, thigh support is on lower side, still better than the likes of Verna. Where Grand will score over its nemesis is the use of space, the roomy and airy cabin. That's its selling point. Crank up the engine, and there is the diesel clatter! The 3-pot is smooth, but not the most refined, when you compare it with similarly priced four cylindered. On the move its not sprightly, there is a bit of turbo lag say up to 1500 rpm. Its not as easy to drive as Figo, neither it goes berserk like Swift, its more like middle of the road. What has improved is the ride and handling department! The mushy feeling in the rear bench is gone. There is more feel to the steering, it weighs up as speed builds up, a huge improvement over last generation. Overall its a really good product, its got a nice feel to it. Yes it misses out on a few points, torque figures should have been a little bit more, the headlamps should have had a more character. But these certainly are not deal breakers, one can live with it. Thumbs up to Hyundai!